Find out why over 100,000 men have stepped up, and over 98% of hosts would recommend Stepping Up! Each session is designed to take about one hour to complete, video sessions average 25 to 30 minutes and small-group discussion averages 20 minutes. Each participant will need a workbook (click the orange button below). Bring nationally renowned ministry leaders to your church for a one-day men's event with the Stepping Up Video Event. Designed for use as a single-day event, video-based messages are combined with group interaction and personal reflection. Dennis Rainey hosts the four sessions that focus on defining manhood, living courageously, building a life of faith, and stepping up to lead. Featured experts Robert Lewis, Matt Chandler, Tony Dungy, Voddie Baucham, Bill Bennett, and others lend expertise in four engaging sessions that include dramatic stories, humorous vignettes, man-on-the-street interviews, and expert teaching. 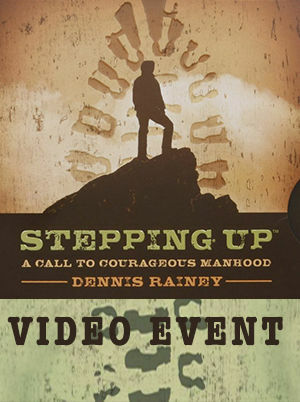 The Stepping Up Video Event is perfect to kick-off a men's ministry season, as an outreach event to men in your community, or as a weekend retreat study. Each participant will need an event manual (purchase below).